But why this focus on Sweden, Denmark and Finland? Finland is not even an Indo-European language speaking country. 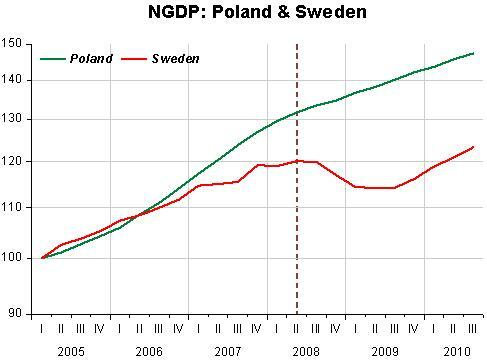 Would it kill you to insert a graph of NGDP for Poland? A country who’s language actually resembles Swedish or Danish? Or is the graph to disturbing for you to produce? I take up Sumner´s post and include Polish data. 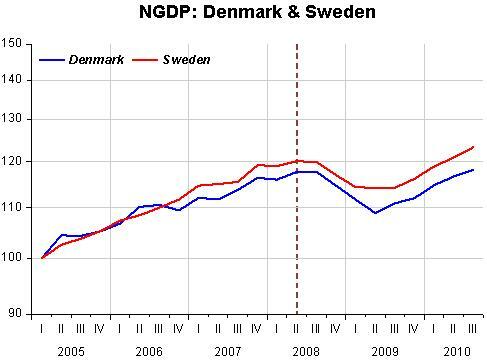 To focus on the more recent period that includes the “crisis”, all the GDP data (from the OECD database) are indexed to January 2005. 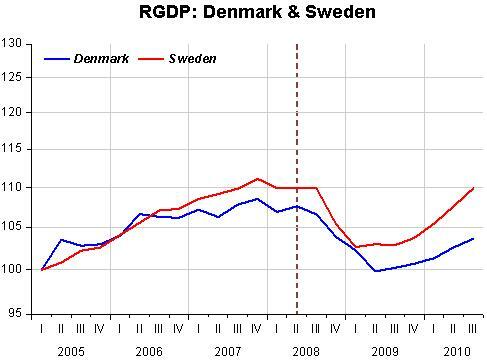 The first two pictures compare NGDP and RGDP, respectively, in Sweden and Denmark. 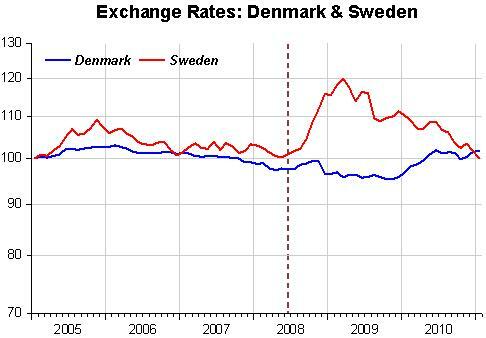 Sweden has “exchange rate freedom”, while Denmark, although not a euro country is tied to the euro (ERM). The third figure shows that it surely seems that having the option of devaluing is positive for the economy´s performance. The exchange rates are effective nominal rates from the BIS – measured as a weighted average of a broad set of bilateral exchange rates. 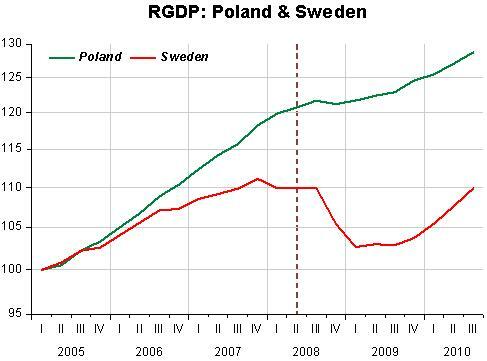 The next two pictures compare NGDP and RGDP in Sweden and Poland. Both have the “devalue option” but it appears that other factors also had an effect on the “awesome” performance of Poland, which cannot be explained solely by the fact that Poland devalued more than Sweden. Mark, it´s up to you to come up with reasons for the Swedish/Polish differential performance! A couple of days ago Scott Sumner put up a post on “What successful monetary policy looks like”. The showcase was Sweden. I travel over the “day line” to try an “experiment”, comparing Australia and New Zealand where both countries, like Sweden, belong to the Small Open Economies (SOE) group of countries. While in the case of Sweden it´s all about sophisticated capital and input goods, in Australia and New Zealand it´s all about commodities. How do these two economies compare in the conduct of monetary policy, remembering that both adopt the “inflation targeting” approach to MP? The comparative analysis is done for two distinct periods: 1997-99 that contains the Asian Crisis and 2006-2010 that encompasses the commodity boom-bust-boom within the world financial crisis of 2008-09. The first picture gives a good characterization of both countries, showing the long running close relationship of their exchange rates against the dollar and commodity price index. 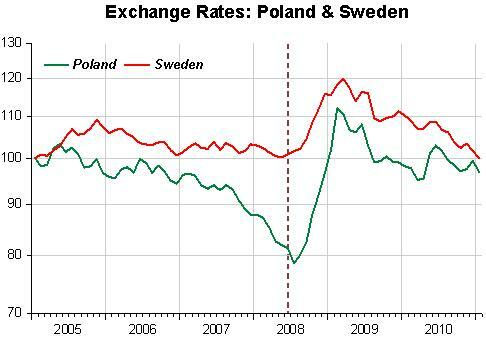 It´s hard to distinguish exchange rate movements between the two countries. Although hard to distinguish, the interpretation of this process by the Reserve Banks of each country was very different in the late 1990´s. 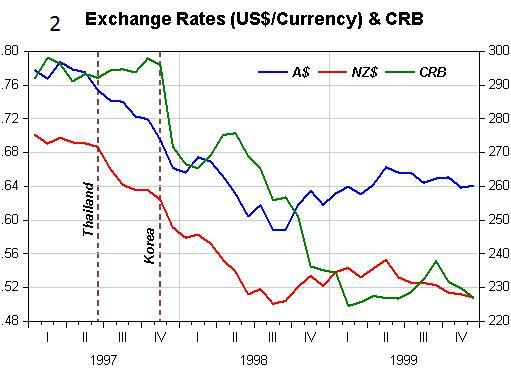 The Reserve Bank of New Zealand adhered to a strict Monetary Conditions Indicator (MCI) according to which any depreciation of the NZ$ had an expansionary/inflationary impact (i.e. tantamount to policy “easing”). The Reserve Bank of Australia was much more pragmatic, trying to interpret the “nature” of the shock, in this case a negative shock to the terms of trade from the Asia Crisis, which tended to be contractionary/deflationary. The following set of pictures show the behavior of exchange rates and commodity prices, the MP action described by the policy rate and what happened to real growth and inflation (headline and core) in both countries. No contest, Australia “wins” hands down! 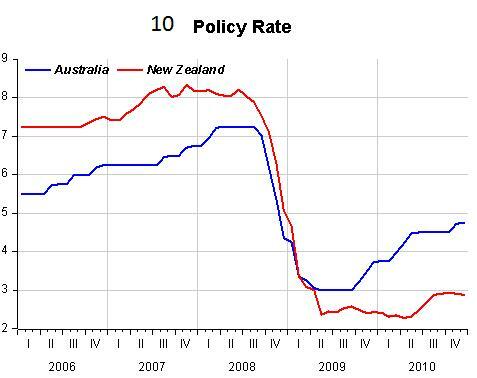 Ten years later, with the accumulated experience, New Zealand had become more “flexible” in its policy decisions, but not “smart” enough to “beat” Australia in the game! 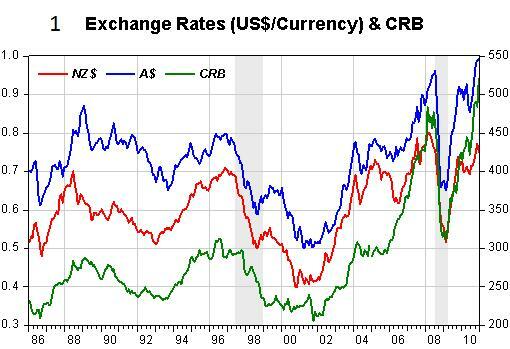 The next graph shows the exchange rate-commodity price relationship from 2006 on. 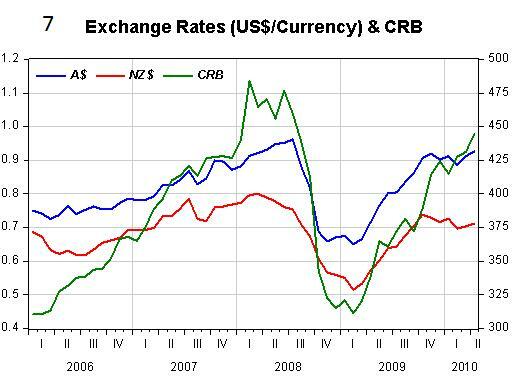 Up to mid 2008 the commodity price boom is closely associated with appreciation of both exchange rates, as expected. The following pictures show that this price boom was responsible for the rise above trend in nominal expenditures in both countries, more so in Australia. 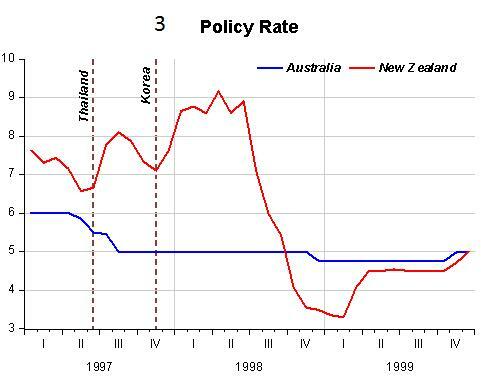 So, even though policy rates were being raised MP was “easy” during this time. 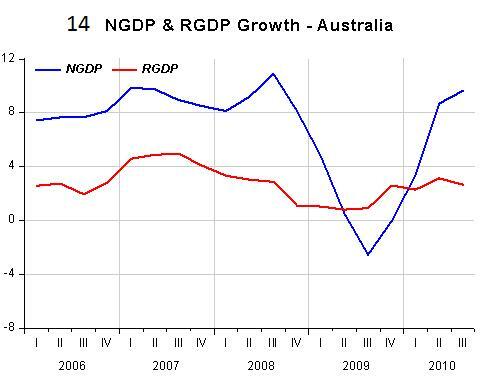 I surmise Australia´s short run supply curve (SRS) was quite steep. 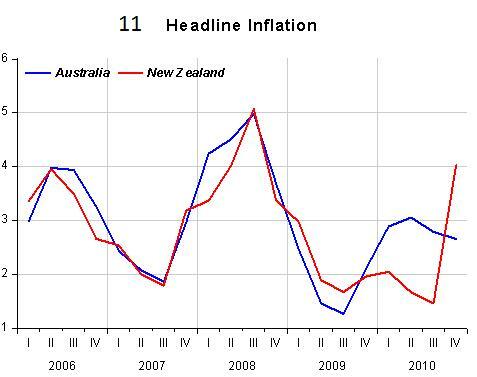 For similar growth rates in Australia and New Zealand, Australia experienced inflation (as seen from similar peaks in both headline and core), which was not the case in New Zealand where core inflation remained relatively flat. (At this time Australia´s unemployment was at an historical low of 4%, indicating the economy was operating close to full capacity). 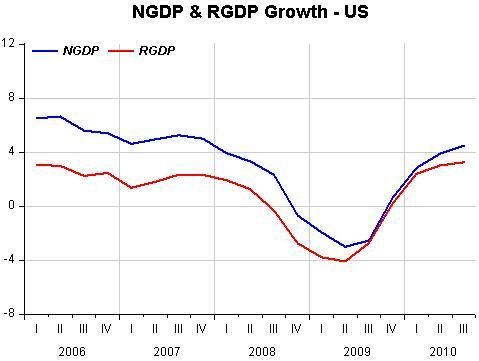 The big difference shows up when the “sh… hits the fan” in mid 2008 with nominal spending in the US falling through the floor. Commodity prices dropped significantly and the exchange rate depreciated in tandem. 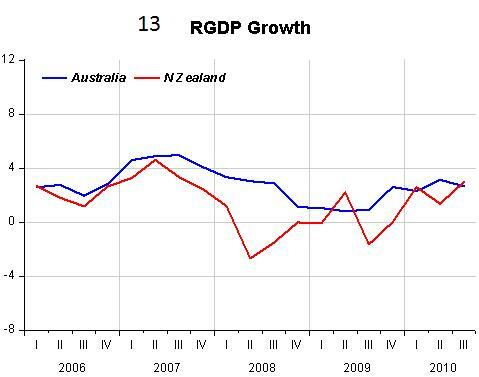 While in New Zealand real growth turned negative, Australia only experienced a real growth slowdown. In Australia nominal spending growth turned strongly negative, but that reflected mostly the fall in inflation, a very different outcome from what was seen in both the US and UK, where the fall in nominal spending mostly reduced real growth. Good MP in Australia shows up in the period leading to the crisis, when it did not go “all out” (or as intensively as New Zealand) to constrain the rise in nominal spending from the commodity price boom. So when the crisis came it was well positioned to “calibrate” the drop in nominal spending so as to keep it close to the trend level. Unemployment went from 4% in early 2008 to 5.8% in September 2009. 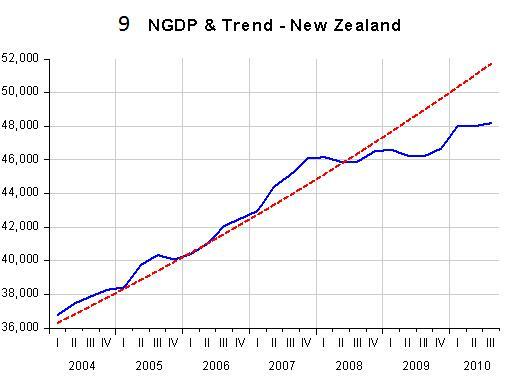 Now it stands at 5%, the same as in early 2006, when the boom was in full swing. The commodity price boom is back on and the RBA continues to reflect on it. So, grading on a curve, the RBA gets an A! Bernanke is at it again. In a speech last friday and in a new paper, he gives new life to the global savings glut hypothesis (GSG) that he first put forth in 2005 as an explanation for Greenspan´s “Conundrum” (the fact that after mid 2004, with the Fed increasing the policy rate (FF), long term rates “stayed put”). This time he extends his original arguments by considering the type of assets desired by the emerging economies (the savers) as they recycled their dollar reserves into US investments. Indirectly, this discussion, which has been going on for several years, smacks of an effort to absolve the Fed from responsibility for the financial crisis which erupted with the bursting of the house bubble. For many (see this post by David Beckworth), bad monetary policy in 2002-04 (“rates too low for too long”) is a major factor behind the housing boom and ensuing crisis. My take is very different. First, I don´t think “low rates” were connected to “savings glut”; second, I don´t think monetary policy was “easy” in 2002-04 and third, I don´t think these two factors had much influence on the housing price boom (and it may not even right to classify it as a “bubble”). It certainly has been fashionable, especially given the GSG hypothesis, to fault Asians in general, the Chinese in particular and an assortment of other developing and emerging economies, not only for those previous problems but also for present day ones! I like to think 1997/98 was the moment when “it all started”. The major economic event of those final millennium years was the Asian crisis, quickly followed by the Russian and Brazilian ones. As the figures show, coinciding with those events, there developed a large gap between savings and investments in a broad set of countries. But this state of affairs did not fall out of the blue. It was the successful result of the policies and actions recommended by the IMF and others (see, for example, Martin Feldstein´s “A Self-Help Guide for Emerging Markets”, Foreign Affairs March/April 1999) following those events. On the other side of the “adjustment equation” was the US, the only major economy growing robustly at the time (Japan was in the midst of its long slump and Germany/Europe was wobbly). 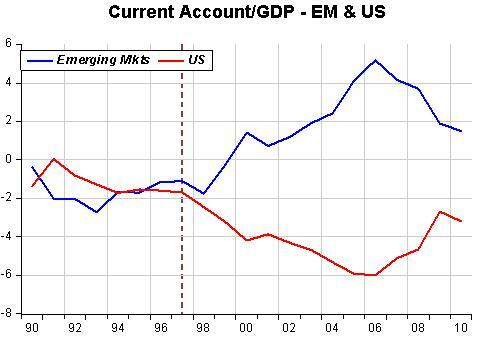 This state of affairs – a growing current account deficit in the US to counterbalance a growing surplus in emerging markets – was baptized by Michael Dooley, Peter Garber and David Folkerts-Landau in 2003 as “Bretton Woods II”. To call this an “international imbalance” sounds strange since it was the “balancing” mechanism. If an unintended consequence of the adjustment process was fraud (from lack of supervision) in addition to government giving the wrong incentives by “encouraging homeownership to all”, that is a wholly separate issue. Krugman suggests that the crisis is the Revenge of the Glut. I prefer to ascribe it to “payment due for sins of omission, false testimonials and political greed”. Whilst in Asia and emerging markets resources were being diverted from the non tradable to the tradable sector, in the US the opposite movement had to occur. In 1997, in addition to all the “incentives to homeownership”, the US government abolished capital gains taxes on homes sold after two years. Given the need to transfer resources to the non tradable sector, this opportunity was too good to be ignored. So, not surprisingly a “housing boom” ensued. 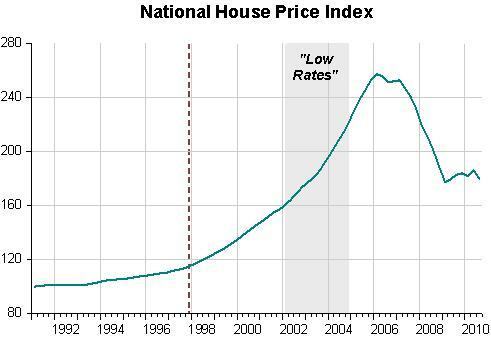 The figure below shows national house prices (Case-Shiller). It is clear that the rise in prices starts in 1997, long before the “too low for too long” rates were in place. But the national house price index masks very different price behavior in different regions, states and metro areas. Compare, for example, Texas and California, or Nevada and Arizona. 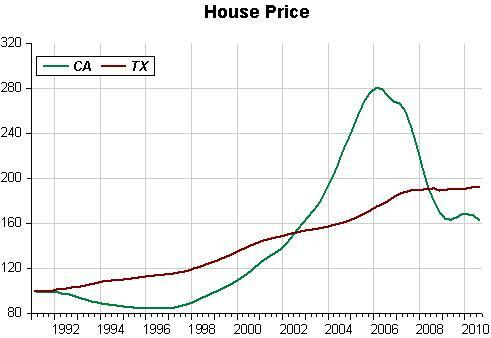 Population in Texas grew almost double the rate in California but house prices in Texas behaved very differently. 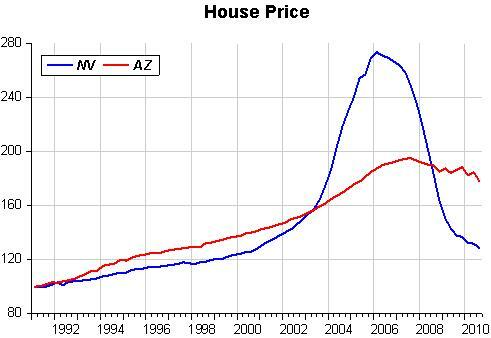 Both Arizona and Nevada experienced strong population increases but again, while house prices in Nevada shoot up after 2002 and then drop like a stone after 2006, prices in Arizona behave much more “smoothly”. One important reason for these very different price behaviors is the presence of “zoning laws” or land development restrictions. California has them in abundance, while land development in Texas is mostly uninhibited. Nevada is a good test case. With most of the land federally owned, until the early 2000s new development permits were easily obtained, so prices were “well-behaved”. That changes in 2002, following pressure from environmentalists. It´s a no brainer: prices go up when supply restrictions become strong. In the midst of all these events, what was happening to monetary policy? In 1997 the “Great Moderation” was in full swing. The graph below characterizes this fact by showing that nominal spending was evolving along a stable level growth path. Maybe tricked by financial fall-outs of the Asian/Russian crises, in 1998 the Fed allows spending to grow “excessively” (i.e. monetary policy becomes “easy”). 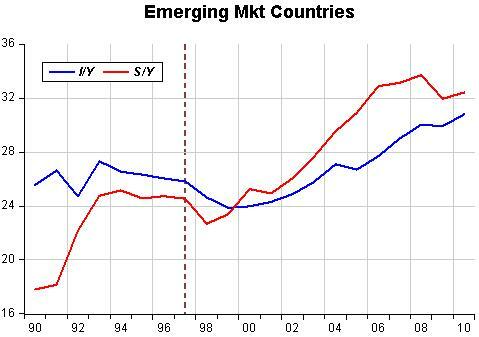 A correction begins in late 1999, but there is an “overshoot” and monetary policy becomes “tight”. 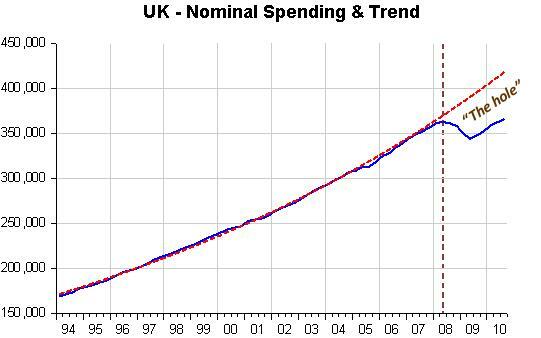 By the end of 2002 nominal spending (aggregate demand) is 2% below trend. The fact that nominal spending begins to grow back towards trend at this point is an indication that monetary policy was “correct”. After all, the trend (level) path should be the “target”. The (in)famous 2002-04 period is graphed below. Let´s start from the end. Between June 2004 and July 2006 the FOMC raised rates from 1% to 5.25% by increments of 25 basis points in all 17 meetings. In his February/05 H-H testimony before Congress Greenspan used the term “conundrum” (Latin for enigma) to describe the fact that long term (including mortgage) rates had not followed suit. The story ends in July 2007 to exclude the crisis period that began in August with the Bank Paribas hedge funds fracas. Funny that there are few mentions of the “reverse conundrum” that took place between January 2001 and May 2002 (a notable exception is this Cleveland Fed Commentary of January 2002 by Altig and Nosal). 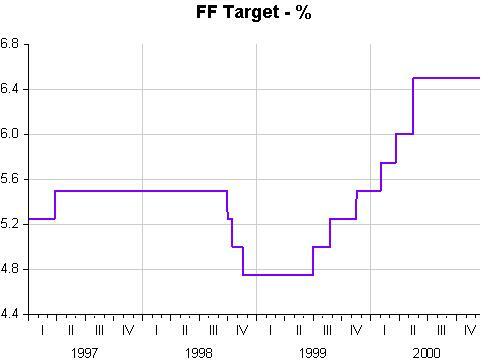 While the FF rate was brought down from 6.25% in December 2000 to 1.75% in January 2002, the long rate did not move. But just at that point inflation began to fall and the 10 year bond rate decreased. 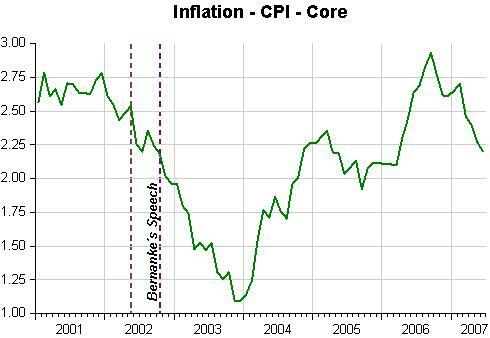 Bernanke´s famous “helicopter Ben” speech in November 2002 followed by the FOMC´s statement at the May 2003 meeting where it was said that “… In contrast, over the same period, the probability of an unwelcome substantial fall in inflation, though minor, exceeds that of a pick-up in inflation from its already low level…” helped keep long rates at this somewhat lower level (around 4%). 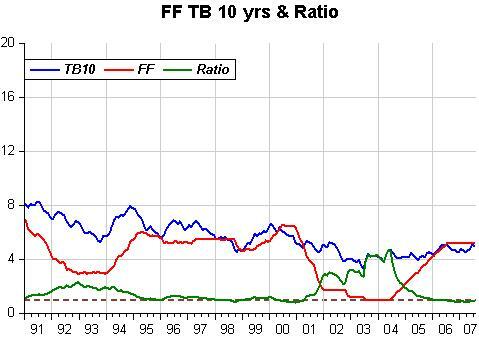 On the way down and than on the way up, the FF rate did not directly affect the long rate. Is this tied to the GSG hypothesis? I doubt it. In my view, all the commotion around the “conundrum” is tied to the consideration that, according to Greenspan, “it is a well accepted fact that the absence of change in the long rate at the same time that the short (FF) rate changes significantly defines a break in the historical relation between those rates”. Can we observe this “fact” in the data? 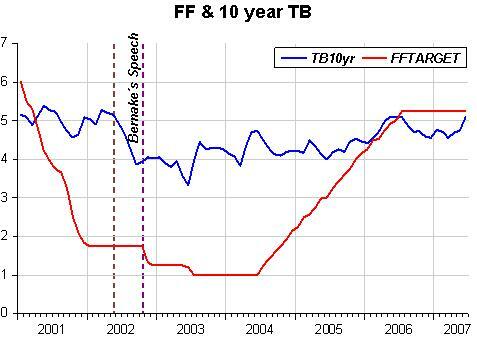 A simple way to check if long rates usually move in tandem with the FF rate is to see if the ratio of the 10 year rate to the FF rate stays close to 1 at all times. The graphs below are illustrative of an apparent change in the relation after 1990. 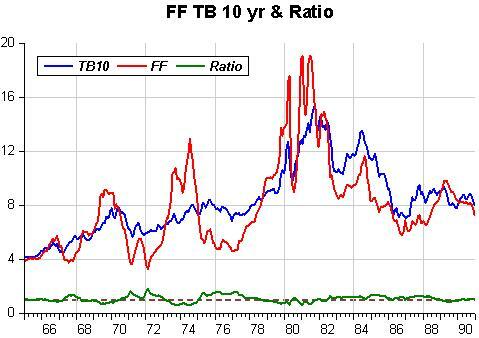 Between 1965 and 1990, the ratio of the 10 year rate to the FF rate never drifts for too long and keeps very close to 1. This is true for the rising inflation period (1965-80) where there are large swings in rates as well as for the falling inflation period (1982-90). 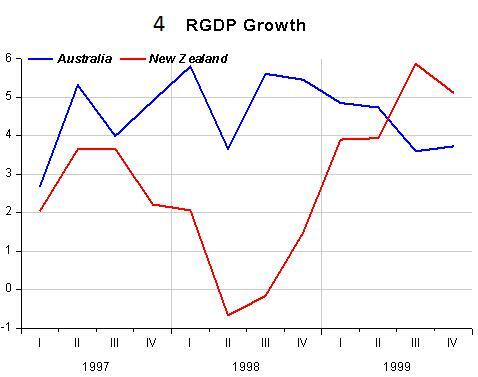 However, this is not so after 1990 despite much smaller swings in rates. During 1992-94 the ratio remained persistently and significantly above 1 and even more so during 2002-04. More formal (regression) analysis supports this result. While for the whole 1965-90 period as well as for the shorter 1982-90 period of falling inflation, the slope coefficient is statistically significant and the monthly variation in the FF rate also explains a not insignificant portion of the variation in the long rate (15% to 20%), for the post 1990 period the slope coefficient is not statistically significant and the variation in the FF rate explains less than 1% of the monthly variation in the long rate! It appears that if we can find the reason for this marked change in the behavior of rates we will have “solved” the “conundrum”. The figure below graphs the same variables only now for the period 1955 -64. 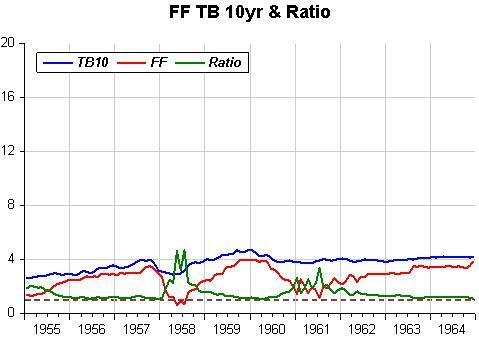 Contrary to what was observed for 1965 -90 , the 10yr/FF ratio also shows persistent and significant departures from 1, much like the 1991 – 07 period. What does the 1955 – 64 period have in common with the post 1990 period? Both periods are characterized by low (falling) inflation and, importantly, the absence of expectations of rising inflation. In other words, in both periods the monetary authority possesses credibility. Fifty five years ago inflation was not something that “kept people awake at night”. Less than 25 years before the Great Depression had brought deflation to the fore. More recently, credibility was obtained with great effort and many years of hard work. Why is it that central bankers – this was the case of the Marriner Eccles Fed in the 1930´s, the Burns Fed in the 1970´s – like to put the “blame” on “nonmonetary forces”? Go figure that! Instead of “rehashing” the past, Bernanke should write about the mistakes he made in 2008, when he let nominal spending take a dive. But he can´t very well do that because he had already written about this situation with regards to Japan in 1999. So, instead of Beckworth´s four questions for Bernanke I only have one: Why didn´t you do in the US as Fed Chairman what you said should have been done in the case of Japan as an academic analyst/researcher? 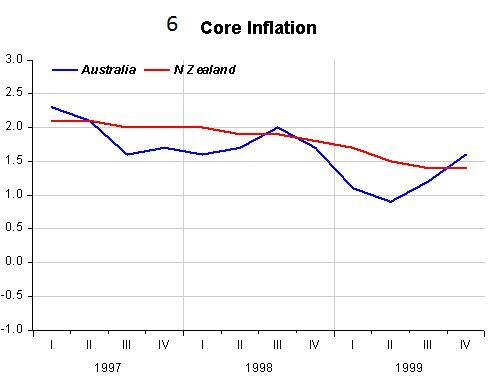 The graph plots three measures of “core” inflation from 1994 onwards. The period was chosen because while in the 1980´s, after the Volker Fed brought “core” inflation down from over 12% to a range between 3% – 5%, in the early 1990´s the Greenspan Fed succeeded in keeping “core” inflation inside a range of 1.5% – 3% (from which it recently dropped). As usual, to some the latest uptick is “cause for grave concern”! I hope it will go higher! The Producer Price Index report released by the Labor Department today is the latest sign of rising inflation pressures in the U.S. in early 2011. In the UK “journalistic competition” drives opinions. This one cites Tolstoy! The UK’s financial establishment is replete with officials, analysts and commentators who are superbly educated and, no doubt, have formidable IQs. But intelligence is useless, as Tolstoy explained, in the face of opinions which, for all kinds of self-serving reasons, are etched in stone. That is the situation Britain is now in. When it comes to inflation, the “authorities” are in denial. Let´s take a look at pictures so as to have an idea of what has been going on. 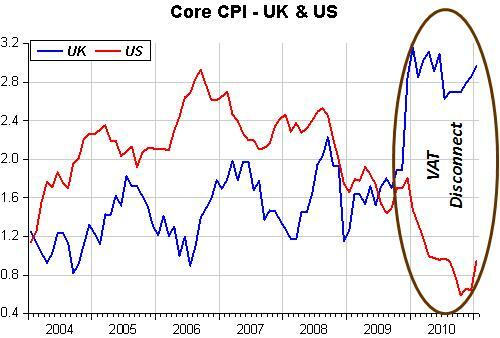 The first compares headline CPI inflation in both countries (UK is blue, US is red). Two “disconnects” are evident. 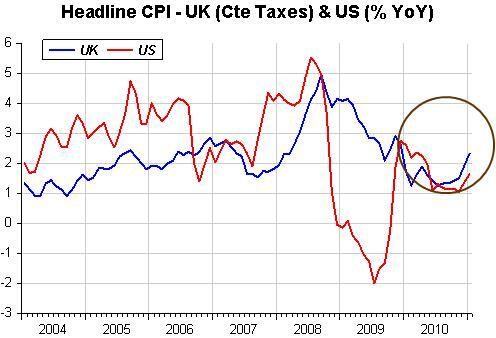 The first between mid 2008 and mid 09 when the US headline CPI falls much more than the UK headline CPI. The second takes place over the past year, with UK headline remaining higher. The following graph explains the second “disconnect” mentioned above. It plots the same headline US CPI but the British Headline CPI assumes taxes are constant (the moves in VAT that took place in December 08 (down), in January 09 (up) and the most recent increase last month are not “counted”).With that adjustment the more recent difference between headline inflation in the US and Britain disappears. The following picture explains the first “disconnect”. The steep rise in oil and commodity prices in 2007/08 increased headline inflation in both countries equivalently. Nevertheless the fall in oil and commodity prices after mid 08 have a much stronger impact on the US headline inflation. That happened, as shown in the figure, because the drop in the (dollar) price of oil and commodities in Britain was offset by the depreciation of the pound. 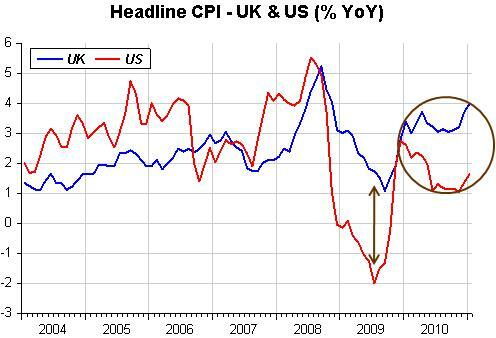 In early 2009, when the pound appreciated headline UK inflation came down quickly. 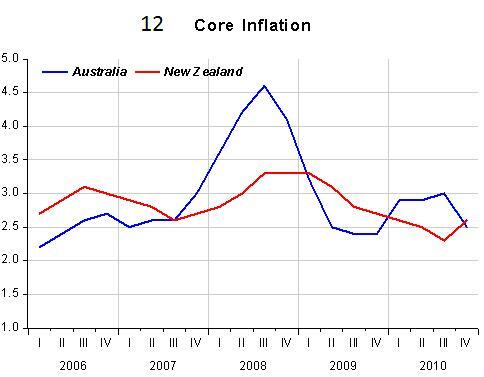 The next figure compares Core CPI inflation in both countries. The clear “disconnect” over the past year is most likely due to the VAT increases. There was something surreal about today’s Bank of England press conference to discuss its latest Inflation Report. The BOE says quite clearly in its executive summary – and Governor Mervyn King repeated it continually – that “the chances of inflation being above or below the 2% inflation target in the medium term are broadly equal”. But there was nothing broadly equal about the line of questioning from the assembled journalists: unless I blinked at the wrong moment, I don’t remember a single question about the risks to the downside. Instead, the Governor was subjected to a sustained and faintly hysterical assault, with almost all the questions a variant on the accusation that the BOE had either deliberately or incompetently lost control of inflation. Under the circumstances, I thought Mr. King handled it rather well. Maybe we really shouldn´t expect things to be significantly different between the two countries. After all, the initial monetary policy mistake of letting nominal expenditure (nominal GDP) “drop like a stone” in “great depression fashion”, was common to both the US and Britain, as can be ascertained in the following (almost) identical graphs! 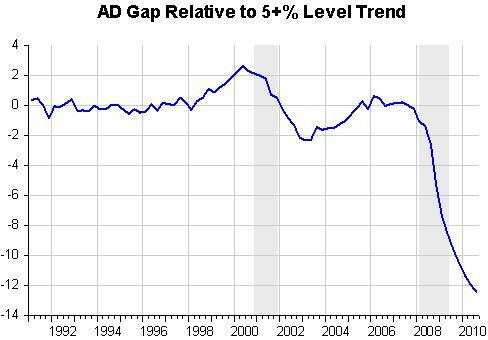 The “hole” to be filled is deep, even if one assumes that the crisis has reduced the “trend level” somewhat. Hawkish discussions of inflation expectations today, and their potential effects on actual inflation in the future, remember the conclusion but seem to have forgotten the argument. Expectations of high future inflation lead to high actual inflation in the future only if workers and firms are able to pass that expected price rise through to their own contracts. If inflation is expected to be 4 per cent this year and this is expected to lead to a 4 per cent rise in nominal profits, then unions will reasonably demand a 4 per cent pay rise as a baseline, to avoid a fall in real wages. If firms then raise prices further in response to the higher wages then a wage-price spiral will result. 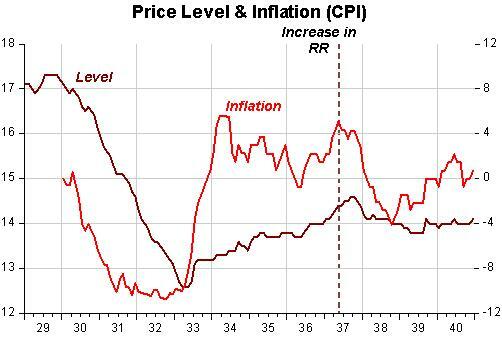 But today, high inflation is due not to a general rise in all nominal prices. 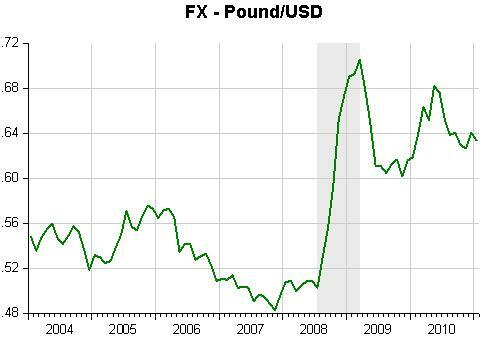 It is driven primarily by the continuing effects of sterling’s devaluation, rising commodity prices, and rising VAT. So the recently-reported 3.7 per cent rate of UK inflation does not reflect a comparable rise in nominal profits. It implies a squeeze on both real profits and real wages because it reflects a deterioration in the UK’s terms of trade: imports have got more expensive relative to exports, so the country as a whole, both its firms and workers, are correspondingly poorer. Over the last two years, the American Recovery and Reinvestment Act of 2009 has injected over half a trillion dollars into the US economy in hopes of spurring recovery and creating jobs. The results have been deeply disappointing. Job growth has been anemic while our deficit has grown, limiting our future policy options. Fourteen million workers are unemployed. The unemployment rate among African Americans is over 15%. This is an American tragedy. What went wrong? Why were the predictions so inaccurate? “When will they ever learn”? while accelerating inflation is not a done deal yet, it’s at this point in the economic recovery when it can take off. These food and energy prices are definitely a concern. It´s always commodities and energy. Back during the first half of 2008 Bernanke was also concerned. Fisher didn´t hold out, dissenting in every meeting between January and August 08. Worse, as late as in the June and August meetings he voted for an increase in rates! More need not be said. The classic anti war song from the 1960´s says it best. Ladies and Gentlemen here´s Pete Seeger. Not so. 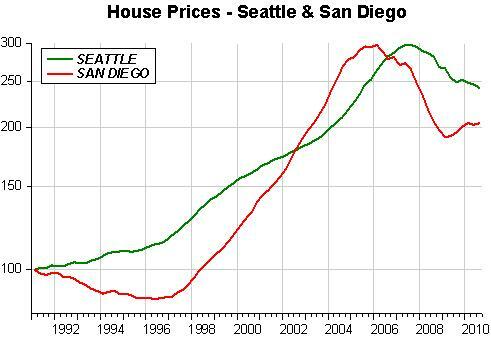 Seattle house prices went up for longer than and by as much as “bubble champions” such as San Diego. At some point reality set in. Although classified as a “well behaved” city, Seattle was not immune from the recession (which was “great”). But that´s not reason enough because neither was Houston, but house prices in Houston have not dropped (actually are still slowly rising). 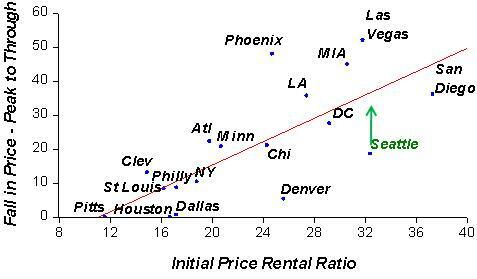 The figure below shows a positive and significant correlation between initial (end 2005) Price-Rental ratios and the size of the subsequent price fall from peak to through for several metro areas. 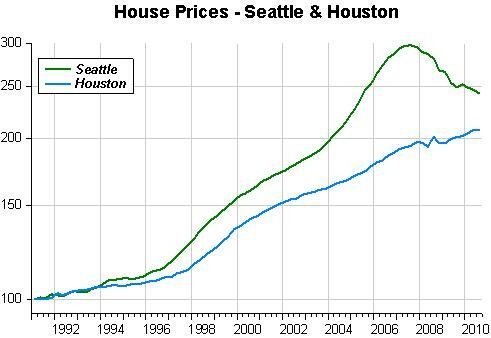 It appears that Seattle house prices have still some way to go before they stop falling! 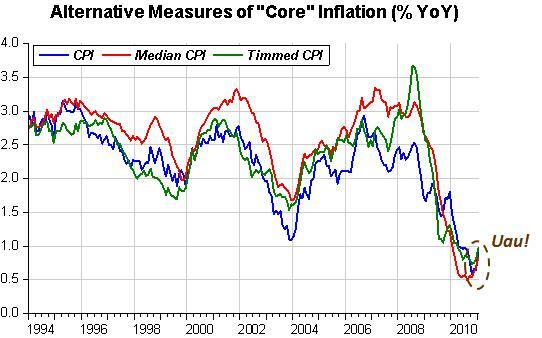 Mr. Plosser doesn’t see a deflation risk for the U.S. economy right now. Even those who were worried about deflation six months ago, he says, have begun to change their tune. That means that, with moderate GDP growth and low inflation in the mix, the only thing left as an excuse for QE2 is high unemployment. Can lax monetary policy change that picture? It´s outside his purview to consider the impact monetary policy had on the severity of the recession, so monetary policy cannot help “fix those problems”. Those people are so into “calibrating” that it is surprising Plosser doesn´t check the data before pontificating! And the story told by the data does not support him at all. 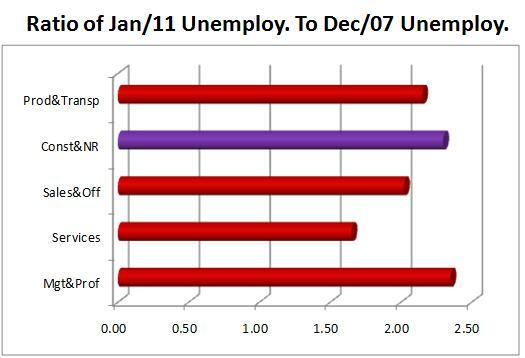 The figures below show that for a very broad category of sectors, unemployment about doubled for most of them after the start of the recession in December 2007. 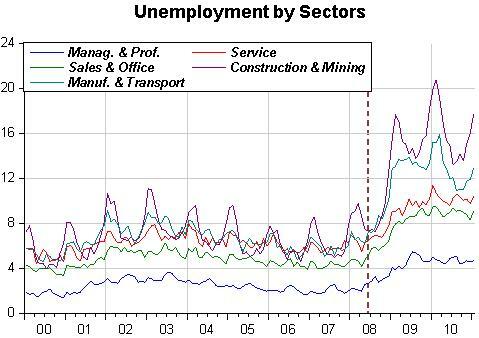 The second figure shows that construction has noticeable seasonality (hard to dig foundations in winter) but what pops out is the fact that unemployment for all categories really got going only after mid 2008, at exactly the same time that the floor dropped from underneath aggregate spending! Construction workers do not stand out at all. The “hole” dug by bad policy was deep and everyone fell into it! But there are those in the extreme opposite camp that think monetary policy is playing the role of the “lone hero” and lacking help from the other “canons” at the hands of policy authorities. As usual, both extremes are VERY WRONG! The Weekend Interview in the WSJ talks to Charles Plosser. It´s revealing. He certainly doesn´t believe in “stuff like that”. After all, as one of the major proponents of Real Business Cycle theory (RBC), Plosser does not believe in the traditional view that takes long term growth as something smooth and slowly changing that could be analyzed separately from cycles (the ups and downs of everyday life). To him (and to to RBC theorists in general) the economy should be viewed as an optimizing dynamic system constantly buffeted by shocks. In this sense, what is popularly called cycle is nothing more than the manifestation of the economy´s search of its new equilibrium growth path! Being consistent doesn´t mean being right. Plosser doesn´t care about “levels”, only “growth rates”. And in thinking so, he disregards important information. In this recent post I illustrated the significance of the “level” of spending in determining the rate of unemployment or level of employment. The take away was that even if spending growth resumes its trend rate, unemployment will remain high and there will be little gain in the level of employment. To “get things going”, spending growth has to be sufficiently strong to close the spending “hole” which was opened by the Fed´s “great monetary error”. It’s illustrative to see what happened long ago in history, when the Fed also “cared only about growth”. The figures below show what transpired during the 1930´s. In 1936, when inflation became positive again, and real growth was robust, the Fed “took cover” and raised required reserves to “cool” things up. 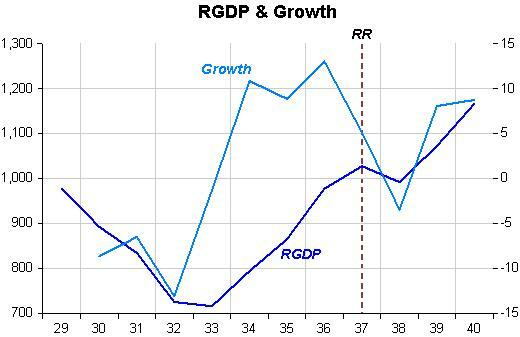 No matter that the price level was far below the level of 1929 and that RGDP had barely regained its 1929 level. 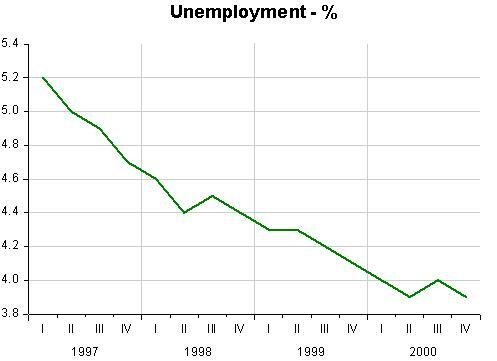 Employment was falling but was still high (reflecting policy induced distortions). A “cover up”! But these guys are the predecessors of Plosser! They also focused on “growth” in prices and output. As Scott Sumner likes to say: “The real problem is nominal”. A financial crisis tipped east Asia into a deep recession in 1997-98, which spread to Russia and then the United States via Long Term Capital Management. To cushion the spillover to America, the Fed first aborted a nascent monetary tightening cycle, then actually cut interest rates. 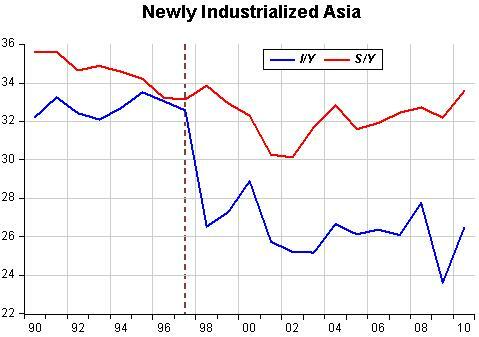 It could do so in part because collapsing Asian demand crushed the price of oil, sending headline inflation below 2%. Today, we have the mirror image. Surging demand in emerging markets that are at or near capacity has driven up commodity prices at a time when America is awash in unused capacity. Just as the plunge in the price of oil in 1998 did not signal deflationary pressure in America, its rise today does not signal inflationary pressure here, unless it works its way into expectations and wages, of which there’s no sign yet. If the Fed were to tighten monetary policy today in response to Asia’s inflation problem, it could be the opposite of the mistake it made in 1998, compounding a deflationary shock at a time when the economy is significantly below potential. My take is different. What happened back in the late 1990s is very different (not a mirror image) of what´s going on at the present time. “It all started in 1997”. I have some confidence in that statement because 1997 was when Paul Krugman (here and here) started writing about “speed limits” and how “pushing the economy” would end up increasing inflation which, according to him (FT June 3 1998), was being “masked” by special factors. The figure below “states my case”. 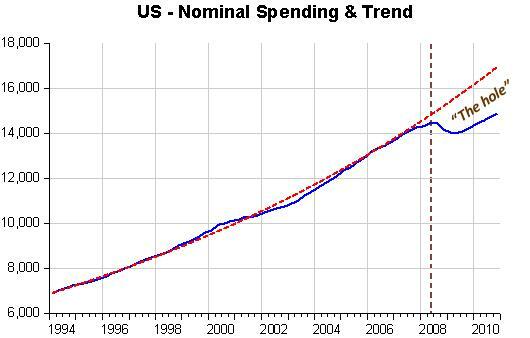 In 1998, the Fed allowed nominal spending to rise above trend. The lowering of the FF interest rate induced by the fall out of the Asian and Russian crisis certainly helped. The subsequent increase in rates had a contractionary effect that ended up throwing spending below trend. This, in turn gave rise to the “too low for too long” FF rate. 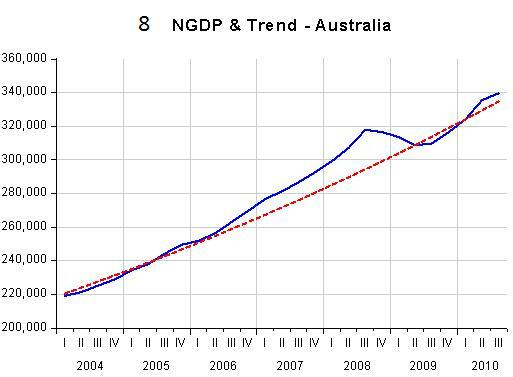 But, as the figure shows, it is what was required to take the economy back to trend. In fact, Bernanke “inherited” a “stable” economy, but ended up losing it for reasons I discussed in another post. In the late 1990´s apart from the deflationary effects of the Asian-Russian crisis through their impacts on commodity and oil prices, the US economy was being buffeted by a positive productivity shock. 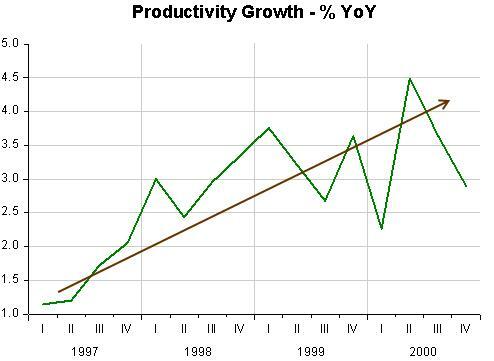 The figure below describes the upward trend in productivity growth. What happens in that situation is best described by a simple graphical dynamic Aggregate Supply-Aggregate Demand (AS/AD) model. As the diagram illustrates, when the economy experiences a positive productivity shock, the (short run) AS curve shifts downward and to the right. Assuming the economy was initially in equilibrium (inflation on “target” and real GDP growing according to “potential” (LRAS)), and indications are that it was, keeping nominal spending growth constant (i.e. 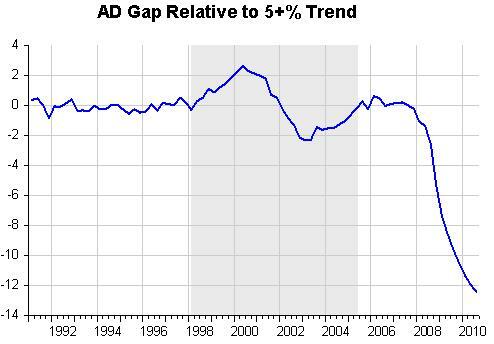 moving along the AD curve), real growth will increase (unemployment fall) and inflation will decrease. The actual data for the period described in the figures below, show that this was the case. Core inflation was falling below the 2% “target” and real GDP (RGDP) growth was 1.1 percentage points higher in 1997-00 than in 1992-96. Unemployment was also falling. This situation was the “mirror image” of the “stagflation” 1970s and also something that “defied” the conventional wisdom (see Krugman above). Headline inflation also fell, magnified by the drop in oil and commodity prices. 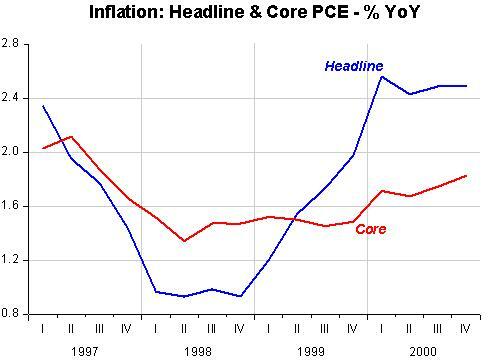 But we notice that headline inflation went back up as soon as oil prices began to increase again in early 1999. 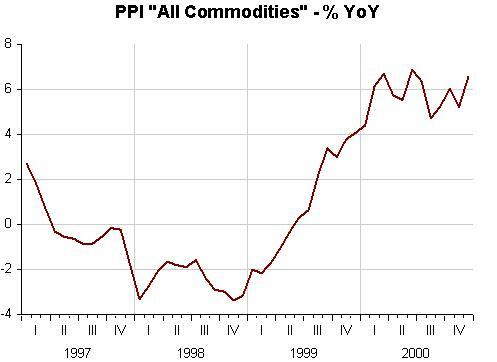 It is clear that headline inflation follows the pattern dictated by the index of commodity prices (“All commodities PPI”). 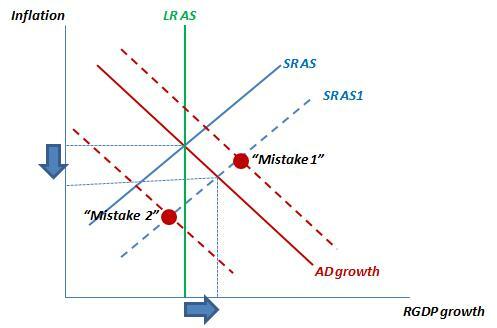 Therefore, by “loosening” monetary policy (be it because inflation fell below “target” or as a defense mechanism against the financial fall-out (LTCM) from the Russian financial crisis), the effect was to increase AD growth and so raise RGDP growth above what it would be and the subsequent tightening (maybe to counteract the rise in headline inflation), destabilized the economy. The interest rate moves are depicted in the figure below. 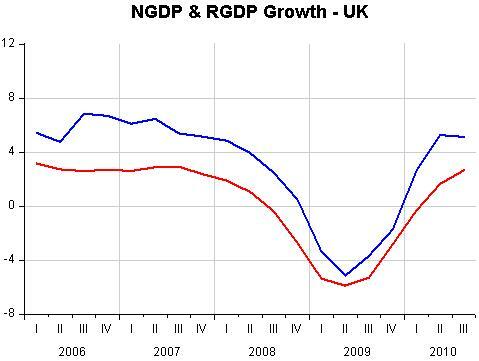 The diagram below shows the dynamic adjustment of the economy following a positive productivity shock. 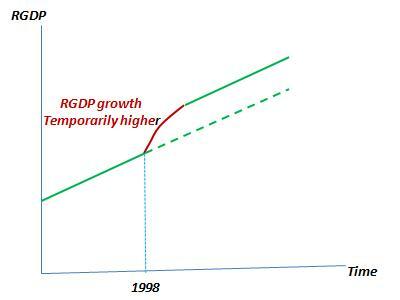 Essentially, there is a temporary increase in real growth to take the economy to its new (higher) path, along which real growth reverts to “potential”. The 1997-00 period was a clear “RBC moment”. The discussion above indicates very clearly that “targeting nominal spending growth along a stable path” is preferable to “inflation targeting” (not only because there are difficulties with defining the “appropriate” index). 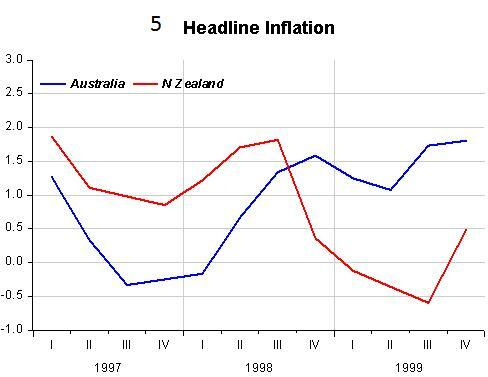 Maybe the monetary policy “tightening” in 1999 was a reaction to the rise of headline inflation. A big mistake as it turned out. The same mistake was made years later by Bernanke, but the consequences this time were much more severe. I hope the same mistake is not made again, and on this point I totally agree with Greg.